Possibly the single most influential event in my career happened over 25 years ago. I lost my temper at a client. The client had requested a meeting. They had a new, complex, system they wanted implemented in the software we managed for them. The client was very very excited. I was not excited. I was annoyed. I (in my youthful experience) felt it was unwise, difficult, and all round a stupid idea. I walked in with a chip on my shoulder. I took the first opportunity to take offense. I tore the poor woman’s document up one side and down the other. I pointed out logical flaws, grammatical flaws and anything else I could find. I was truly unpleasant. And I walked out of the meeting not realizing I was in the slightest bit upset. My response: “Really?” I honestly hadn’t noticed. I’d lost my temper, brought someone almost to tears, and hadn’t noticed. I should probably throw in a little background at this point. I was working for a moderately large company that was growing quickly. ~20 DBAs and maybe 500-600 people total. I’d been working with this client for about two years, and it was our largest client. Even then I was considered one of the better DBA/developers (say top 2-3 of the 20 of us). The client (of course) asked that I immediately be fired. And I don’t blame them in the slightest. I got very, very, outrageously lucky and the CIO told them I was the only one capable of working their account. That they would start looking for someone else but I was going to have to continue to work on it for at least 6 months. I was then called in and told off. I worked my rear off that next 6 months. Anything that client wanted was done almost instantly. The process she was so excited about? I did it. I did everything I could to make that client happy. At the end of that 6 months the client and I had worked things out (mostly). She was happy with me, and I’d learned a very important lesson. In fact I learned two. First of all I had a problem. I’ve always known that I have hard time dealing with and understanding others. Over the years the database stuff has come relatively easy, I mean I enjoy it after all. But I’ve had to work hard over the years to get better at dealing with people. I’ve learned to remain calm when working with people. To encourage and to teach. I even enjoy it. In fact I’ve gotten good enough that I occasionally get compliments on my reviews, but I’ve never forgotten that this is not my strong suit. The next thing I learned is that control is not enough. You can learn self control all you want but it occasionally fails you. I had to learn how to release negative emotions and thoughts. That’s where communication comes in. A few weeks ago I found out I was meeting with a vendor to explain a process I was working on. I wasn’t overly pleased by this. I expected trouble and I could very easily have gotten it. I found my heart beat getting faster and I’m sure my blood pressure was going up too. And this was 48 hours prior to the meeting! If I’d stamped down on those feelings, bottled them up and let them fester they could very easily have come boiling out during this meeting. I would have been a problem. Regardless of what the other person did. So what did I do? I talked to a couple of my co-workers. They’ve dealt with the same people and could sympathize. They were nothing more than a sympathetic ear and let me vent some steam to someone who felt the same way. I called my wife and talked to her. I love my wife, and she loves me. She didn’t understand but she didn’t have to. She was a loving non-judgmental ear. She let me vent without adding anything. I wrote a blog post on the subject (blog post recursion!) This let me solidify how I felt. You’d be amazed how much writing something down so that someone else can understand it forces you to think through it and get all the feelings straight. And I started to calm down. Over that 48 hours I got a hold of myself. I made sure my process was bullet proof. I researched the few pieces that I wasn’t 100% comfortable with. The day of the meeting came. I presented my idea. The vendor complimented me! Everything was as smooth as you could wish. The members of my team were happy. The vendor was happy. The developers who had called the meeting were thrilled. But oh how easily it could have gone wrong. And it would have been my fault. Again. So the thought of the day? Temper temper! Oh god, I had this client which was on the nerves of everyone on the company I think out of the 55 people on the floor already over 40 of us didnt want to deal with him and he with us. Lucky for me my manager had the patient of Buhda and I learned to keep my cool still I did get a few frustrating clients and normally I request a peer to assist me as I knew I could explode if I was left alone. Yea, it’s hard sometimes to deal with certain people. Particularly when you know they are customers and you absolutely CAN’T blow up. Thank you. I have also had to learn how to manage my tendency to blow up in situations that I could perhaps handle differently. So far the best lesson I have learned is that when others disagree with me or propose ideas that I find patently ludicrous I should not let that be a reason to become angry. I start asking questions to try and understand why they feel the way they do. I won’t say I am perfect at it but I have learned how to ask some really good “stupid questions”. Thanks right back 🙂 And asking questions is a great idea. I do that myself, I just hadn’t noticed it as an “anger reduction mechanism” before you mentioned it. If I were your manager I would have fired you immediately. 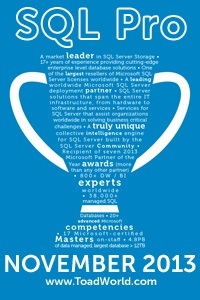 Bottom Line a DBA is just a member of a team that is responsible to architect a solution for a client. Yours is a place of service, not of a premadona database god. As a professional your function is to calmly suggest solution to the client, who will ultimately make the decision on how they will spend their money. Good, bad, indifferent; it is the client who is paying for the solution, not to mention your salary. Get over yourself. Hmm, I think you missed the point. I was young and stupid and I made a mistake. I SHOULD have been fired. I knew it then. I worked very hard to fix that relationship. And I’ve worked very hard since then to avoid that type of problem. But I’m a human being. That means that I have emotions and can still lose my temper. Fortunately I’ve learned a lot since then about recognizing the emotion and even more importantly how to deal with it in a constructive manner. Now aside from that, you wouldn’t be my manager. I wouldn’t work for you. I’m a team player, or at least I try to be, but I do expect my manager to understand that I’m a person. That people make mistakes, and are capable of learning from them. I expect them to be someone who will see a single mistake as an opportunity to learn and not fire someone out of hand for a single mistake out of a number of years of exemplary service. We are all people, we all make mistakes, we all have emotions that get out of hand occasionally. Most importantly we can all learn from those mistakes and become better people.